Apply the same math operations to all numbers in the selected range. Division, multiplication, subtraction, and addition are no longer a problem. Find percentage of a number, add percentages to your numbers, or decrease a number by percentage. Calculate ranges in a click Apply the same math operation to all numbers in a range. 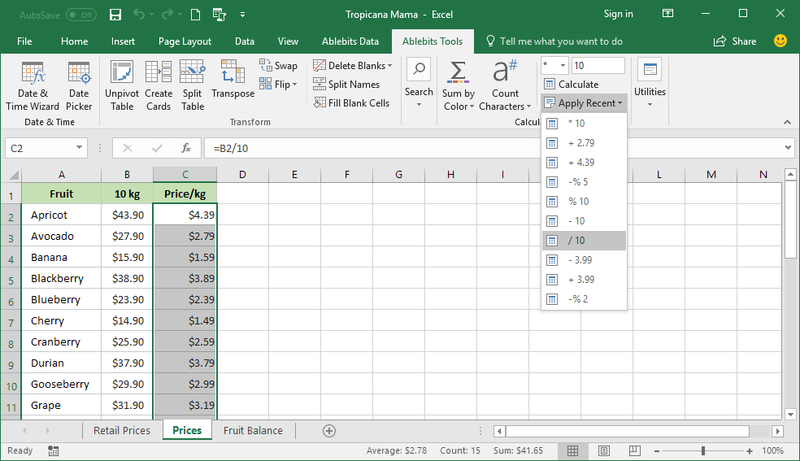 Add and subtract Add or subtract a specific number from all selected cells. 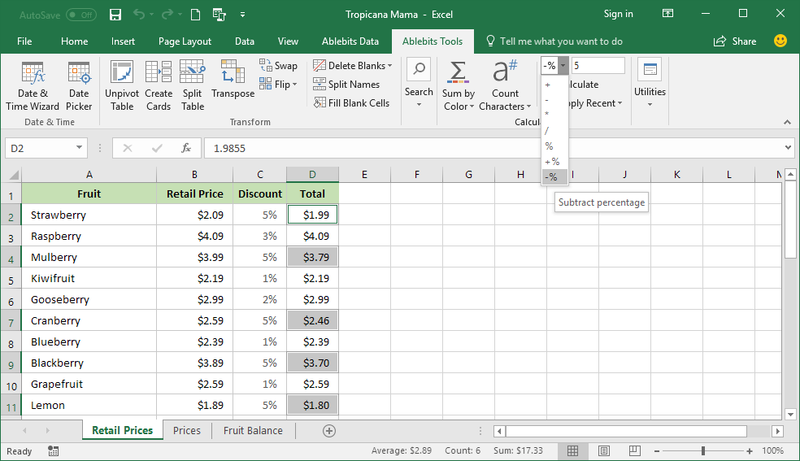 Calculate percentage in Excel Subtract or add percentage to each cell in a range or find the percentage of all numbers. Multiply and divide Multiply or divide individual cells and entire columns. Apply recent calculations Pick one of the last 10 operations to apply it again. 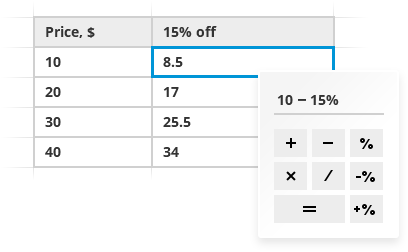 Add new calculations to existing formulas Modify all current formulas in a range automatically based on the math operation you select. What is Calculate Tool and what do I need it for? Calculate Tool lets you apply basic math operations to all cells within a selected range. Add, subtract, divide, or multiply a column by any number. Furthermore, subtract or add a percentage to a number in Excel or calculate a percentage of all the numbers at once. 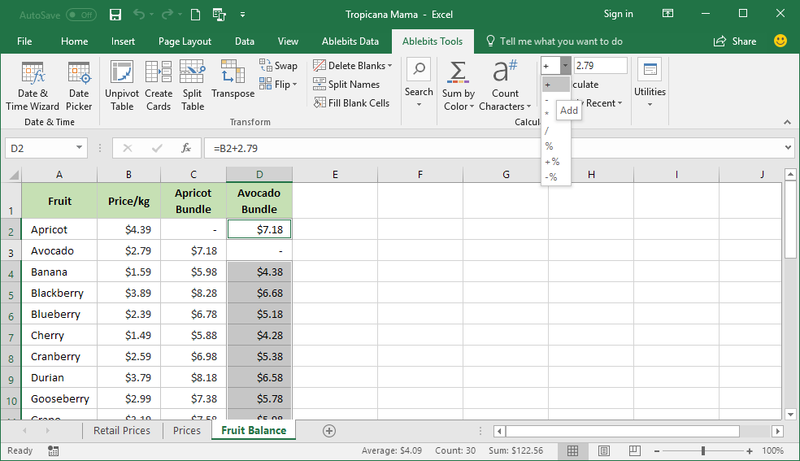 Isn't Excel designed to calculate numbers without any add-ins? Yes, it is :) Our Calculate Tool just makes math operations a lot faster and easier to perform, especially for beginners. 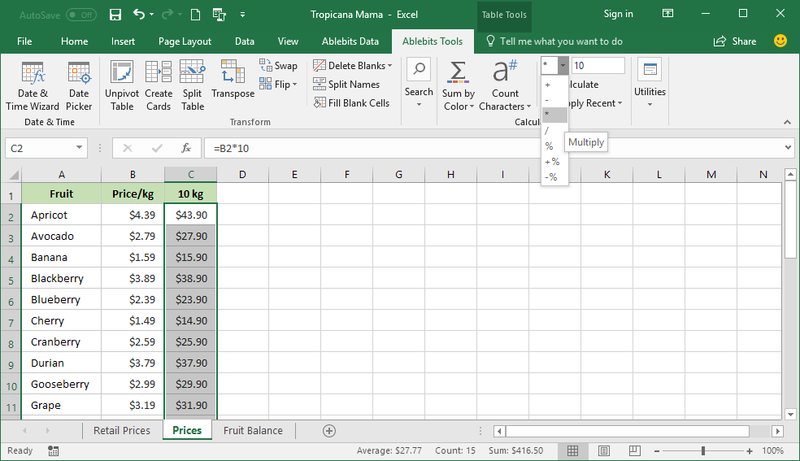 How to multiply in Excel with Calculate Tool? Select the range with numbers. Select "+" from the tool's drop-down list of options and enter the number. How to calculate percentage of a number with Calculate Tool? Select "%" from the drop-down list of options and enter the percentage. Does this tool work with existing formulas? Yes. 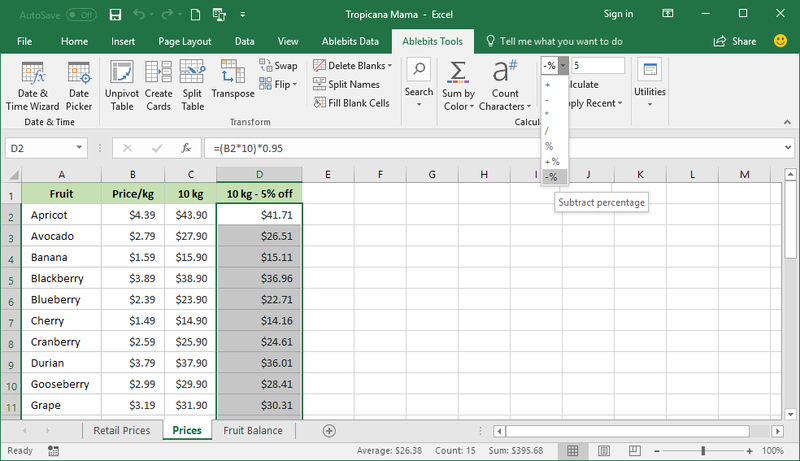 Calculate Tool can add more calculations to your current formulas. What if I want to perform the same calculation in another workbook? Calculate Tool saves the last 10 operations. So, you just open your workbook, select the desired range, and pick one of the last operations you’d like to apply.